Aquiring data about the I2S capabilities of currently available mini computers proofs to be quite difficult. While there is some information about the I2S capabilities of the RPi, there seems to be nearly to none about the Odroid C1+ mini computer which was released in Summer 2015. However, in order to decide which platform is more suitable for audio projects, it is important to have some insights about jitter, data format etc. This article tries to gather information from various sources, sum it up and do some measurements and try to compare the two platforms.. 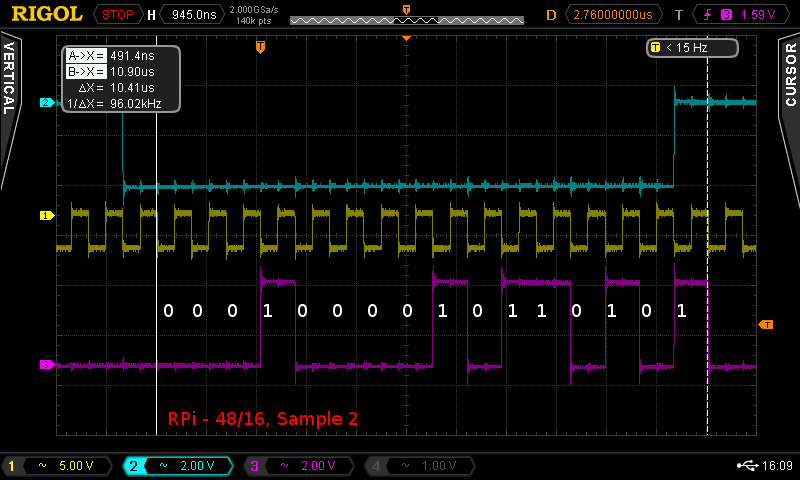 The RPi does not have any clock that is accurate for the needed I2S clocks, so it generates it out of the internal clock. 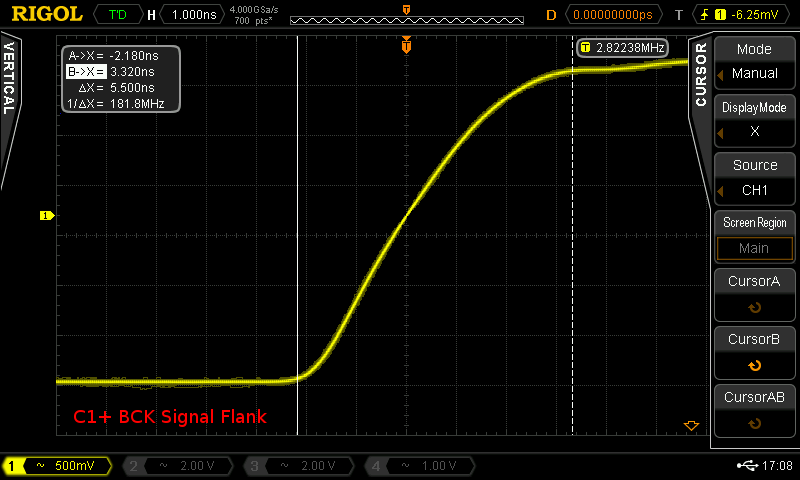 One can see that the signal alternates to create the needed clock speed which unfortunately leads to a fixed jitter of 2.5ns. The signal is bit correct as it should be. However, it is very interesting that the Raspberry Pi can obviously generate 24bit signals as the diagram above clearly shows. 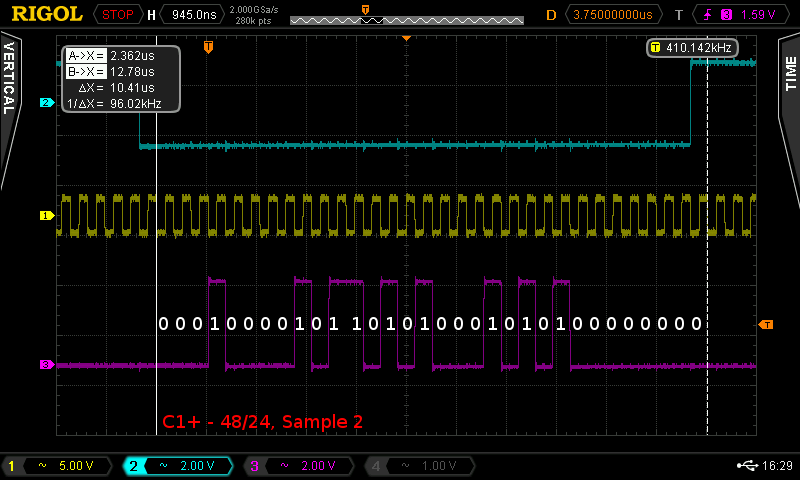 The driver switches from 16 to 32 bit and sets the last 8 least significant bits to “0”. Probably the truncation from 24 to 16 bit (as mentioned in other articles) has been a driver issue and is not due to hardware limitations. 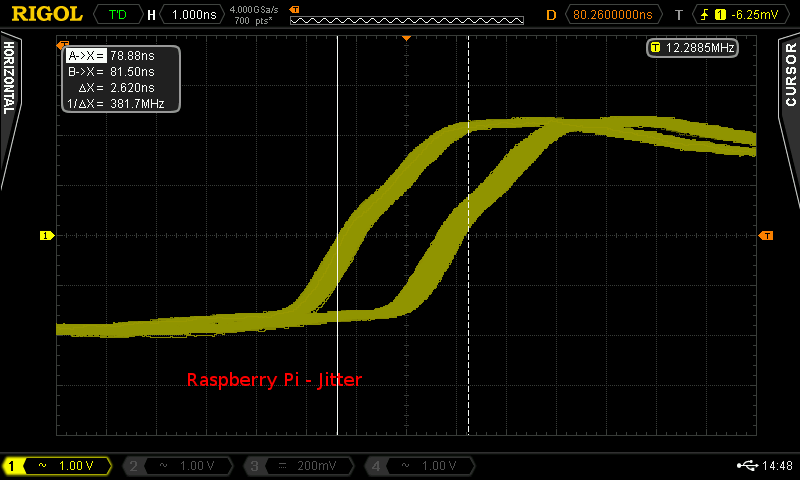 So, about 99% jitter is approx 1ns, which seems to be better than the jitter in the Raspberry Pi. The signal is bit correct, too. 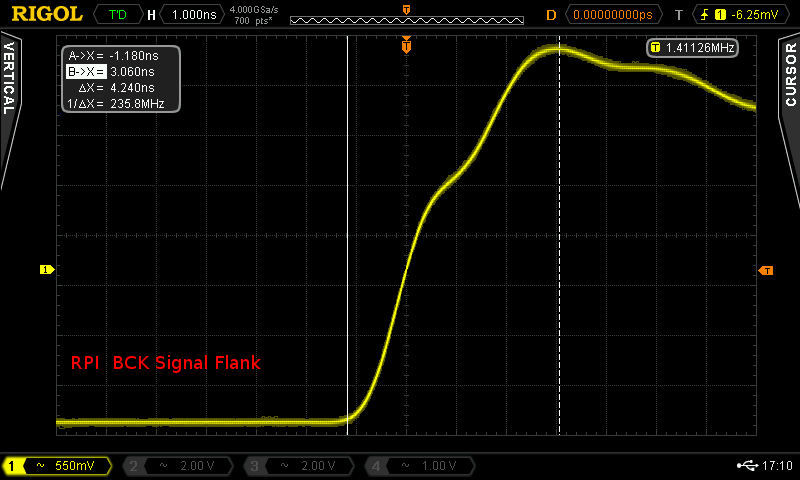 In comparison to the Raspberry Pi, the signal seems to be always 32bit long, whereas the 16 LSB bits are set to “0”. However, this could also be some driver issue. As expected, the signal is bit correct too, so it seems, the Odroid C1+ works the same as the Raspberry Pi. Performance/Power: The Odroid C1+ feels a lot faster and responsive than the RPi. 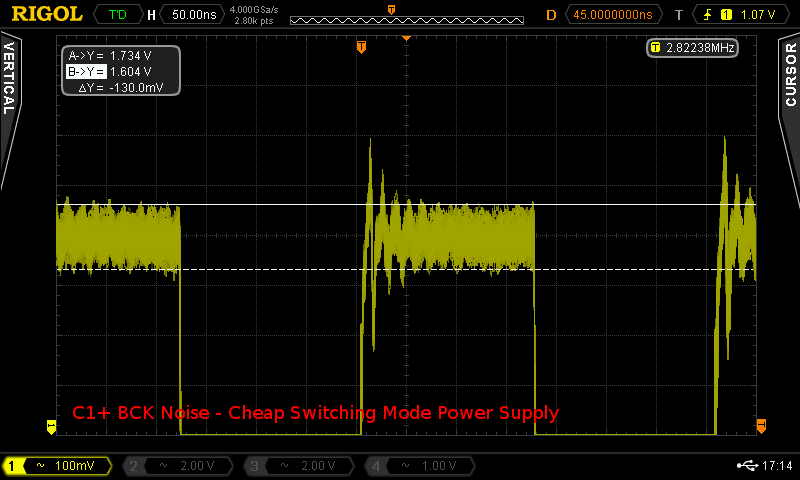 It does, however, consume twice as much power as the RPi. It probably depends on the application, which platform is more appropriate. 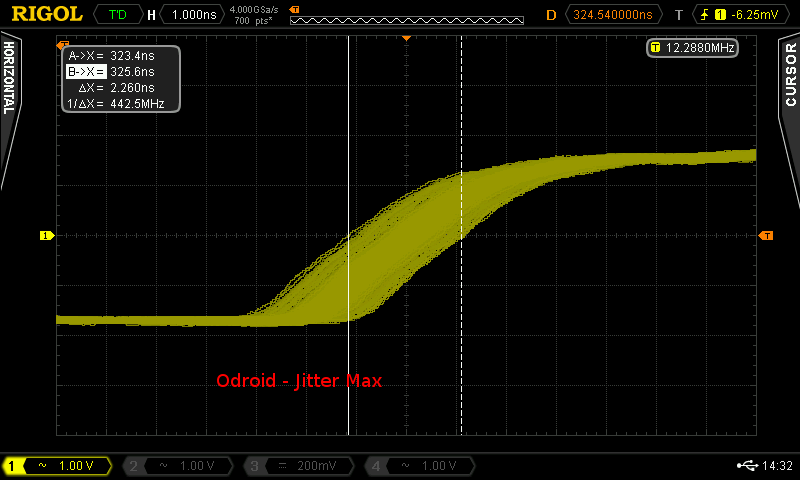 Jitter: For jitter, both platforms perform similar. The jitter is approx. 2.5ns for both platforms, whereas the RPi distributes the jitter quite precisely to two frequencies, while the C1+ spreads jitter evenly but on the other hand statistically most jitter is less than 1ns. 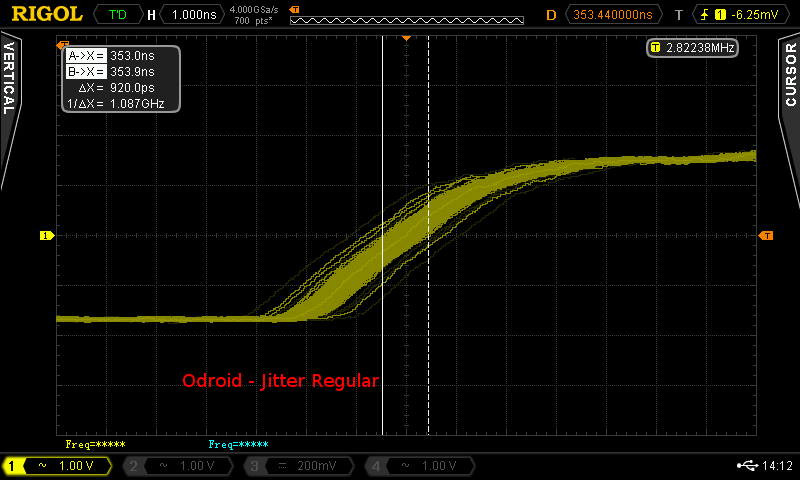 I cannot tell if there are be any audible differences, but I would estimate that the Odroid C1+ performs better as overall jitter seems lower. Anyway, due to the missing oscillators which can generate exact I2S BCK signals, both platforms (and probably most similar mini computers) suffer from this issue. 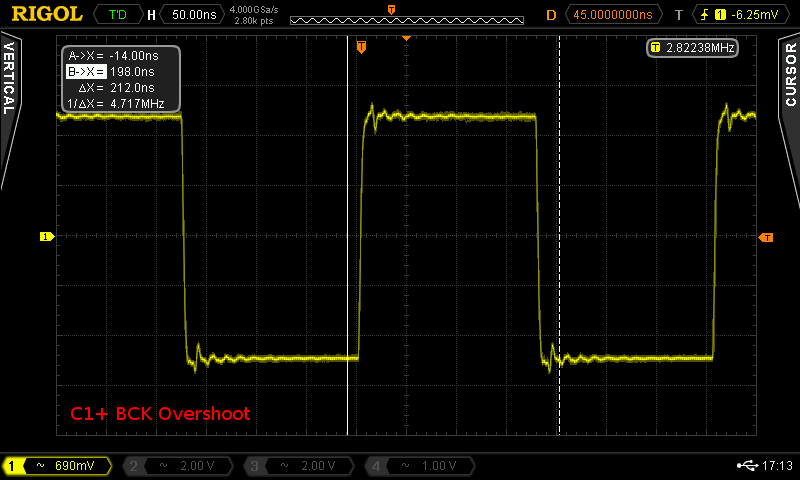 The only solution would be reclocking, whereas I know of two projects in this area: The Acko S03, which is simple and cheap but cannot eliminate jitter completely due to its design and Ians Reclocker, which is based on a buffer and should create very exact signals but seems to be more expensive and not so easy to obtain. Signal Encoding / Bit correctness: Both platforms seem to encode the I2S signal correctly. The only difference seems to be that the RPi encodes 16 bit signals in 16bit packages, while the C1+ always uses 32-bit packages. I cannot say how DACs would handle this, however, I estimate that most should be compatible to both encoding schemes. 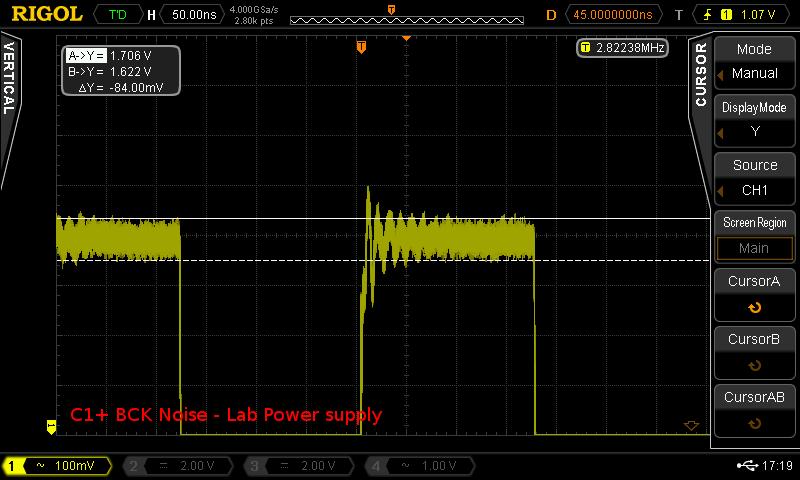 Noise: Although this may not have too much impact, and most users will anyways use some kind of isolator ICs to isolate the I2S signal, a decent power supply for the RPi / C1+ is always a good option. Well, maybe the above findings clear things up a little and give some insight, however, it would be a major advantage if the clock generation circuits of the discussed hardware would be released openly.